There was something electrifying about watching yet another nation rising up against tyranny. The uprising in Tunisia, carried by Al Jazeera directly into the homes of millions of people across the Arab world, has undoubtedly energised hopes for change and might yet be the catalyst for sweeping reform in the Middle East. For over 23 years, Tunisia has been ruled with an iron fist by President Zine el-Abidine Ben Ali. If ever there was a despot who felt safe and secure, it was Ben Ali. But under the surface, a frustration and a rage was growing. High unemployment, falling living standards and decades of repression had set in train dangerous forces of discontent. In the end, all it took was just one deeply frustrated and angry young man to spark the explosion that brought down the whole rotten system. Desperation and hopelessness often drive people onto the streets, defying bullets and bayonets, truncheons and teargas, to confront their oppressors. The events in Tunisia quickly reverberated across the Middle East. “Every Arab leader is watching Tunisia in fear; every Arab citizen is watching Tunisia in hope and solidarity,” is how one Arab observer aptly summed it up. The Middle East, despite its vast oil riches, is one of the least developed regions of the world with as much as 40% of the population living in poverty. Rampant corruption and mismanagement are largely to blame for this. In addition, despotic Arab governments spend billions on arms but neglect education, health, social programmes and infrastructure development. 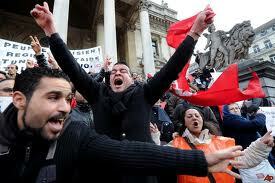 The Tunisian people have now said “enough” and change has come. The same conditions that bred discontent in Tunisia exist fairly evenly across most of the Middle East. Street demonstrations have broken out in Algeria, Jordan, Egypt, Oman, Yemen and Libya in recent days. Arab governments are belatedly responding by lowering food prices, promising jobs and pledging reform even as they are quietly gearing up to crush any hint of dissent. This time it might not be enough. Amr Moussa, the Secretary-General of the Arab League, warned that “the Arab citizen has entered an unprecedented state of anger and frustration” and that “the Arab soul is broken by poverty, unemployment and general recession”. Other Arab commentators opined that Tunisia has “opened the road to freedom in the Arab world” and that it is “a lesson for countries where presidents and kings have rusted on their thrones”. Outside the Middle East, the historic event in Tunisia is being greeted with the usual hypocrisy and dissimulation. France, the former colonial master, who was by far Ben Ali’s biggest cheerleader, quickly condemned him. The United States, another longtime Ben Ali supporter, cynically saluted the courage and dignity of the Tunisian people after it became evident that Ben Ali was finished. Even the World Bank and the IMF, whose reports on Tunisia were always flattering, are now more circumspect. And Navi Pillay, the UN Human Rights Commissioner, who did not have too much to say about Tunisia when Ben Ali held sway, has now offered to send a team to investigate the recent disturbances. The fact is many Western governments and international institutions chose to close their eyes to the long night of repression in Tunisia because it suited them. Ben Ali’s brutal crackdown on Islamists at home was seen as a valuable contribution to the war on terror. It also kept the restless “Islamic” masses at bay. Even the most repressive pro-Western regimes were always preferred over the alternatives. Stable despots were considered better than uncertain democrats. Islamophobes are already raising fears that if unrest spreads in the Middle East, the Islamists will grab power; one even had the audacity to note that “for all his faults, Ben Ali stood stalwart as a foe of Islamism …”. Never mind that his faults included repression, torture and murder. It is possible that Islamic political parties might come to the fore. The Middle East is, after all, a very Islamic place. However, the West should not fear the Islamists because there is an even more powerful dynamic at work in the region that even the Islamists must contend with: the unstoppable desire of the people for peace, prosperity and progress. The Islamists might hold sway in the short term but in the end they, too, will have to come to terms with the power of the people. It is already happening in Iran. The exciting thing about Tunisia, as one Arab editor wrote, is that “democracy has come without foreign fleets, without the imposition of the star-spangled banner, without the smiling face of [US General] David Petraeus”. Ultimately, it is this kind of democratic flowering that is the most viable and meaningful. It will take time, of course, and a lot of mistakes might be made, but given the chance, the Tunisian people will eventually evolve a workable system of democratic governance. Tunisia might well prove that the choice in the Middle East is not between radical Islam or dictatorship, as the despots would have us believe, but between tyranny and freedom. It is hard to say where all this will now lead but it is clear that a psychological barrier has been broken in the Middle East and the gates of change have been thrown asunder. As the uprising gathered steam, a Tunisian editor asked: “May we dare to dream … to truly aspire to life?” When men dare to dream, anything is possible!